Doyna, Ltd., a New York importer of alcoholic beverages, succeeded in convincing the Board that the registered mark ZHIGULY for beer is primarily geographically deceptively misdescriptive because Zhiguly is a region of Russia, known for beer, whereas Registrant Doyna Michigan Co.'s beer is brewed in Lithuania. Doyna, Ltd. v. Doyna Michigan Co., Cancellation No. 92033012 (September 6, 2005) [not citable]. (3) the misrepresentation was a material factor in the consumer's decision. 66 USPQ2d at 1858. As to the first prong of the test, Petitioner's evidence clearly showed that the primary significance of the word Zhiguly (also spelled Zhiguli) is its identification of a geographic location in Russia. 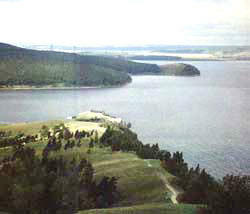 The area is known for its natural beauty and is referred to as "the pearl of Russia." Zhiguly is not an obscure place nor is it a small region; it includes a town, a mountain range, and a national preserve each named Zhiguly. As to the second prong, beer has been produced in the Zhiguly region for more than 40 years, and the region is associated with beer. Petitioner imports beer for its "community" of Russian customers, which numbers some 7.5 million people. Zhiguli beer is listed in the 1982 study "Alcohol in the USSR," and in The World Guide To Beer. Registrant admitted that its beer comes from Lithuania. And thirdly, the misrepresentation of geographic origin was "a material factor in the consumer's decision" because Zhiguly is known for its beer and the relevant public in this country is aware of that connection. "According to the record, there are seven and one-half million people in the Russian-speaking community in the United States who would purchase this beer specifically because of the geographic connotation. *** This is not an insignificant number. That is, for at least this number of consumers the term 'Zhiguly,' and the belief that the beer comes from the Zhiguly region, is material to their decision to buy." Ergo, the Board granted the petition for cancellation on Section 2(e)(3) grounds. TTABlog comment: Along the way to its decision, the Board made various rulings on the admissibility of the 17 items submitted with Petitioner's Notice of Reliance. The Board first noted that, just because Registrant did not object, that doesn't mean that the Board will allow in evidence not offered in accordance with the Trademark Rules. Items 1-5 comprised copies of maps from various printed publications, all admissible under Rule 2.122(e). Item 6 was a copy of Petitioner's requests for admission, which went unanswered; they were admissible under Rule 2.120(j)(3)(i). Items 7-13 were photocopies of pages from Internet websites. Internet materials are "transitory in nature" and are not self-authenticating; thus they are not admissible under Rule 2.122(e) as printed publications. An affidavit accompanying these items and providing information regarding the sources of the printouts was not admissible, since the parties had not agreed in writing to permit submission of affidavits in lieu of testimony. See Rule 2.123(b). Therefore this Internet evidence was not admissible. Item 14, consisting of photocopies of one-page letters from four beverage distributors, were not admissible because they are not printed publications under Rule 2.122(e), and Registrant did not stipulate to the entry of such evidence. Item 15, the affidavit of a Russian-born person living in Tennessee, was inadmissible for the same reason as the affidavit accompanying Items 7-13. Item 16, a photocopy of Respondent's beer label, was admitted by Respondent in its Answer. Finally, Item 17, a letter sent to the Board by Registrant during this cancellation proceeding, was inadmissible because it is neither a printed publication nor an official record under Rule 2.122(e).